According to national surveys, the occupancy rates of passenger cars are falling steadily, mostly as a result of the continued drop in household size and increases in car ownership. Load factors of trucks vary from 47 % for Denmark to 63 % for the UK (excluding empty trips), indicating that better vehicle utilisation can lead to significant efficiency gains. Empty hauling makes up on average 30 % of total truck vehicle-km. Increase vehicle occupancy and load factors. Occupancy rate: average number of passengers in a vehicle (cars, buses, trains, aircraft). Load factor: ratio of the average load to total vehicle freight capacity in tonnes (vans, trucks, train wagons, ships). Empty haulage: percentage of truck-km run empty. Utilisation efficiency is one of the main parameters that determine energy and emission efficiency. 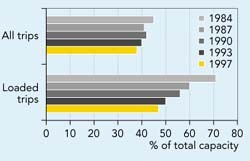 A high occupancy rate in passenger cars and buses has relatively little impact on overall vehicle weight, and therefore on energy consumption. For freight, the relationship is more complex, as a higher load factor is likely to result in a significant increase in vehicle weight and therefore in more energy use and emissions. High load factors are still preferable, however, since low load factors imply a higher number of transport movements, which is generally more environmentally damaging. Measures to increase occupancy rates include schemes for favouring vehicles with more than one passenger (through-traffic privileges) and initiatives to promote car-sharing. Private companies are increasingly promoting car-sharing. There are no targets for these indicators at the EU level. Sweden has adopted targets for increasing the average number of people in private cars by 5 % and the load factor of lorries by 3 % by 2000 (base year 1995) (ERM, 1999). Data on trends in occupancy rates is limited. According to the IEA, occupancy rates of passenger cars in Europe fell from 2.0-2.1 in the early 1970s to 1.5-1.6 in the early 1990s. The decrease is a result of increasing car ownership, extended use of cars for commuting and a continued decline in household size. Progress with car sharing is discussed in Box 6.5. Car occupancy rates also vary for urban and long-distance trips (1.3 and 1.8 passengers per car, respectively) and travel purpose (Table 6.1). Conversely, the occupancy of aeroplanes has risen since 1970 in most European countries; European flights (international and domestic) are now about 70 % full, compared to 50 % in 1970 (ICAO, 1999). Conventional passenger trains are on average 35 % full, while the occupancy rate of high-speed trains is generally higher, varying for different countries and connections (e.g. about 80 % for the TGV Paris-Lyon, about 50 % on average for the German ICE). Car sharing can reduce the number of cars and help to achieve a more efficient use of each car, because the cars are unused for shorter periods and have a higher average occupancy rate. The linkage between increasing car ownership and increasing transport volumes is thereby reduced. Car sharing is becoming more and more popular across Europe, benefiting the participants financially and the environment. The ECS (European Car Sharing) network, founded in 1980, now includes 40 organisations in 350 cities in Germany, Austria, Switzerland and the Netherlands, and initiatives are being developed in the United Kingdom and Sweden. StattAuto Car Sharing GmbH, established in 1988 and operating in Berlin, has about 3 600 members and the number is gradually increasing. The car fleet consists of 180 vehicles travelling an average of 34 000 km a year compared with 14 500 km for the average German car. Most trips (77 %) last less than 24 hours and 56 % of the trips are between 20 and 100 km. The average annual mileage of StattAuto users is 4 000 km per person compared with 8 700 km per person per year for non-users. The average occupancy rate of StattAuto cars is two persons, compared with the German average of 1.3 persons. No EU-wide data is available on freight load factors. The country figures used in this assessment may not be representative for the whole EU, but indicate the type of data that is relevant. UK statistics show that load factors (excluding empty running) remained fairly stable at around 63 % between 1986 and 1996 (DETR, 1998). In Denmark, load factors for loaded trips fell from over 70 % in 1984 to 47 % in 1996, and for all trips (including empty running) from 45 % to 38 % (see Figure 6.10). This smaller reduction is caused by reductions in the share of vehicle-km running empty, which fell from 29 % in 1984 to 17 % in 1996. The decrease in load factors is the result of the combined effect of increases in the loading capacity per truck and reductions in the weight transported per trip probably due to declining densities of modern high-quality goods. Increasing demand for just-in-time deliveries of high-value goods, together with relatively low transport costs, gives companies an economic incentive to prioritise fast deliveries above a more efficient capacity utilisation. EU-wide data on empty hauling is not available either, but a few country examples indicate that there are large differences. Empty hauling makes up only 25 % of total truck vehicle-km in Germany and over 40 % in the Netherlands. In the UK, the proportion of empty runs declined from about 33 % to 29 % between 1980 and 1996. This trend may be explained by the lengthening of truck journeys, an increase in the number of drops per trip, the expansion of load-matching services, a growth in the reverse flow of packaging material / handling equipment and greater efforts by shippers to obtain return loads (McKinnon, 1999). More work is needed to provide reliable and comparable data for occupancy rates and load factors for all modes in general and for rail, sea and air transport in particular. Member States recently adopted a Council regulation (EC) No 1172/98) on statistical returns in respect of the carriage of goods by road, in which they undertook to compile statistics according to standardised guidelines. Eurostat expects that this regulation will yield comprehensive data on freight vehicle utilisation by the beginning of 2000. Occupancy rates for passenger cars differ considerably, depending on the length and purpose of the trip. Breakdowns by purpose (work/education, business, shopping, leisure and holidays) are therefore needed. More work is also needed to develop a better indicator of freight vehicle utilisation. The volume of goods carried is progressively becoming more important as truck space is often filled long before the maximum permitted weight is reached. Weight-based load factors therefore tend to underestimate the true level of utilisation. Further work may also be needed to ensure that empty hauling is dealt with in comparable ways in national statistics. For references, please go to https://www.eea.europa.eu/publications/ENVISSUENo12/page029.html or scan the QR code.